The indicator menu now lists all available ports on all devices, and shows the Device description followed by Port name. 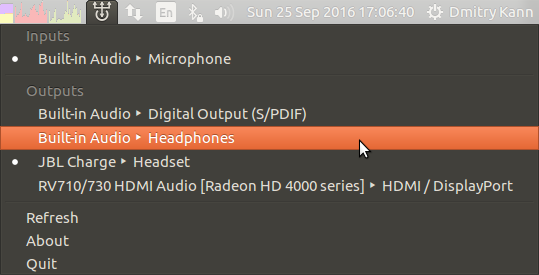 The menu takes port availability into account (for example, when you unplug your headphones, the Headphones port will disappear from the menu and, probably, be replaced with Speakers). The code has been migrated to Python 3. The application is now device- and profile-aware. If the port you're switching to is not available in the current profile, it will pick the most appropriate supported one and switch the device onto it. Support for GTK+2 and Ubuntu prior to 14.10 Utopic has been dropped. It requires at least PulseAudio v4.0.